I am so excited to show off our invitations today! 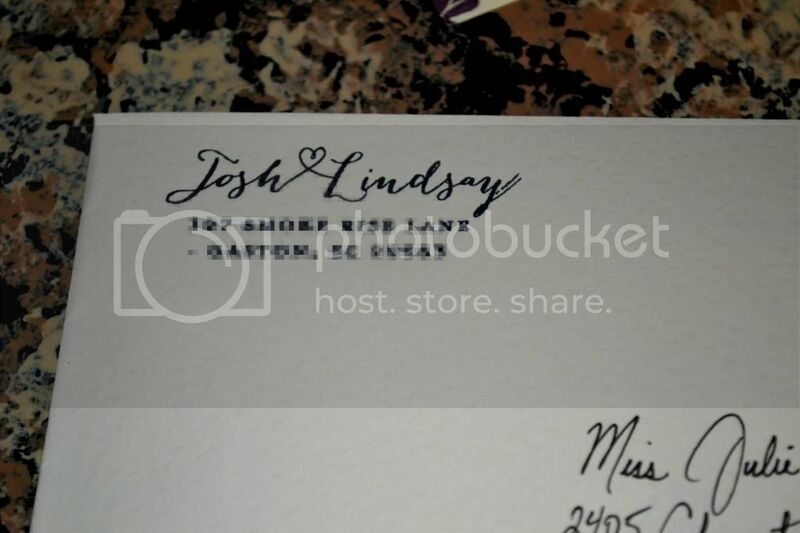 They went out a few weeks ago so they should have arrived in everyone's mailboxes long before now and it is SO fun getting RSVP's in the mail everyday! I was browsing in Michael's one day when I was still in school and I went over to their wedding aisle and when I saw this paper, I thought to myself, how beautiful! 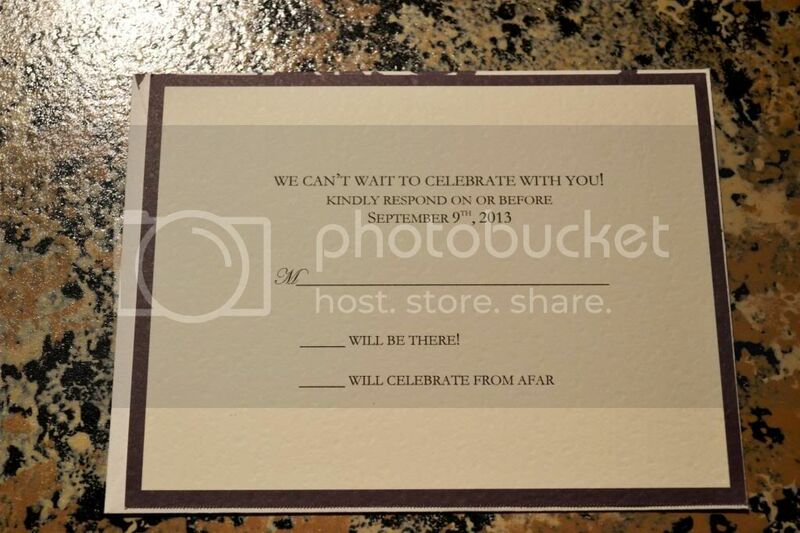 I didn't know exactly what I wanted for the invitations yet but this paper really drew me in. A few weeks later I showed them to Josh and my mom and they both loved me so we bought a few boxes, all on sale! I contacted a paper place in town to print the invitations for us and after a few back and forth emails they just stopped contacting me, I was waiting on our proof and never got it...I guess they didn't need the business that badly! So I decided to just print them myself, they were made for that anyway! 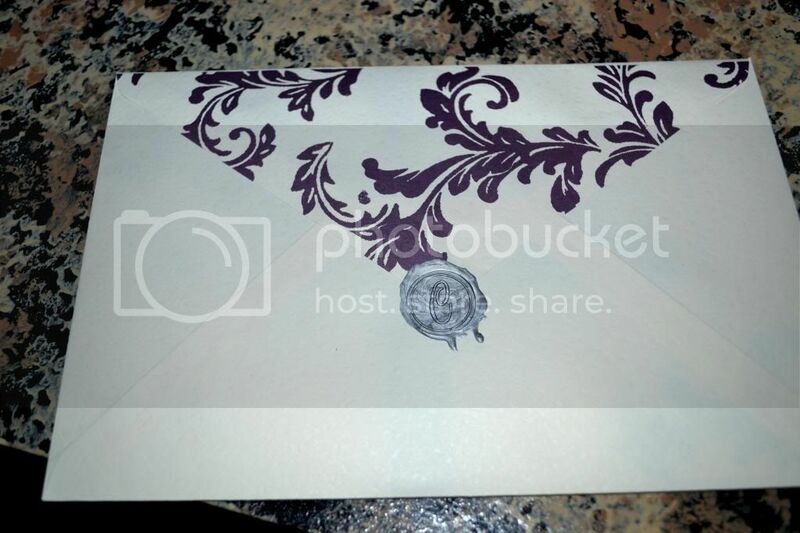 The brand of the invitations were Gartner Studios and in the box they give you their website and you put in the UPC code of your invitations and it pops up with a template to enter your information for the invites. It's so nice because they have all of the margins set but you are able to customize everything and make it your own. We got a Canon printer from Wal-Mart for around $60 and we got to printing. I was literally SO nervous the first one that I did, I just didn't know how they were going to come out. I wouldn't even look at the printer as it was rolling out, haha! I finally mustered up the courage to look and I squealed because they were so beautiful and exactly what I envisioned! I printed all of the invitations as well as the response cards and they all turned out perfect! I feed them into the printer one by one and I printed each one, one at a time, just so there wouldn't be a chance that anything would get jammed in the printer. Each box of invitations came with 40 invitations and 40 response cards along with the envelopes for each and we bought several boxes, all of them turned out great! They also give you extras to practice on in each box, which was very nice! 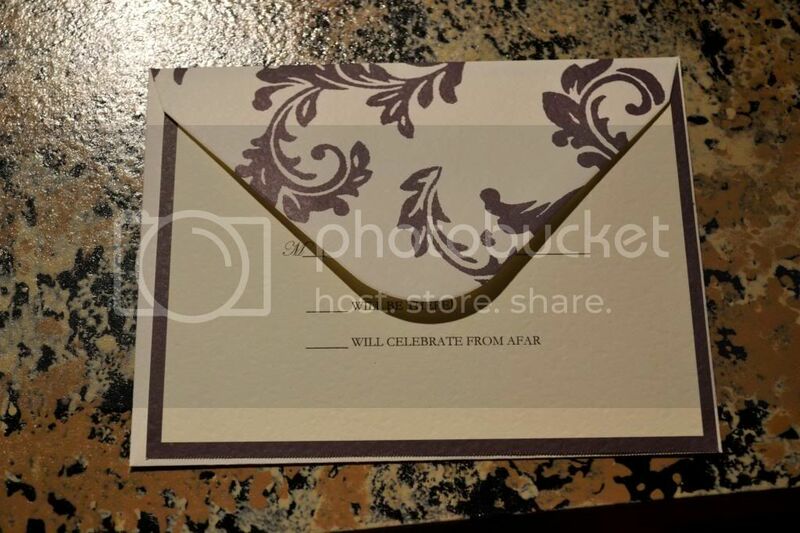 The envelopes match the design on the paper and I love the simplicity of it! 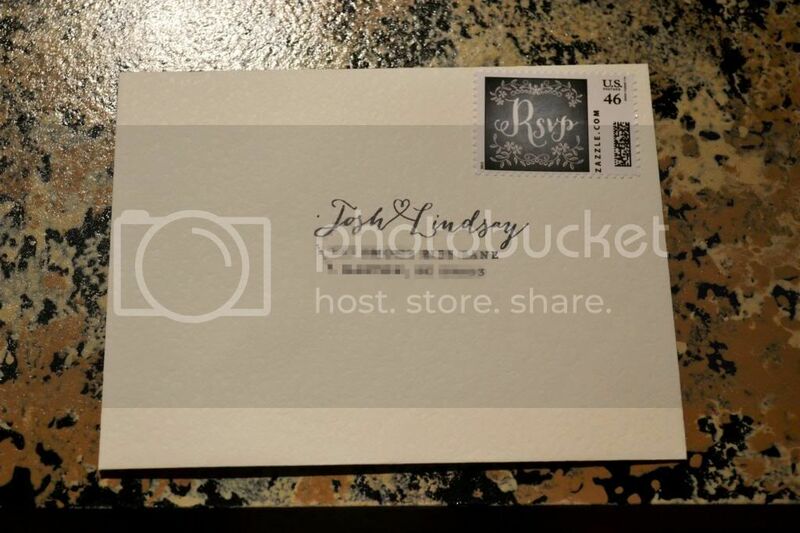 I ordered a stamp off of etsy to use to address the RSVP cards and to put in the return address spot on the invitation envelope. I was SO pleased with the stamp and the etsy show was wonderful to work with! It's so nice to have this stamp because we'll be able to use it on our thank you notes as well! 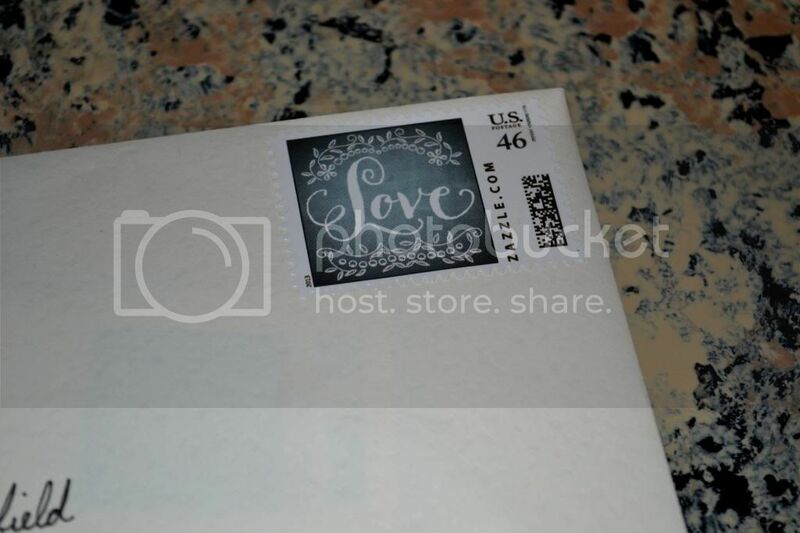 I ordered stamps from Zazzle and got "Love" ones for the invitations and matching "RSVP" ones for the response cards. 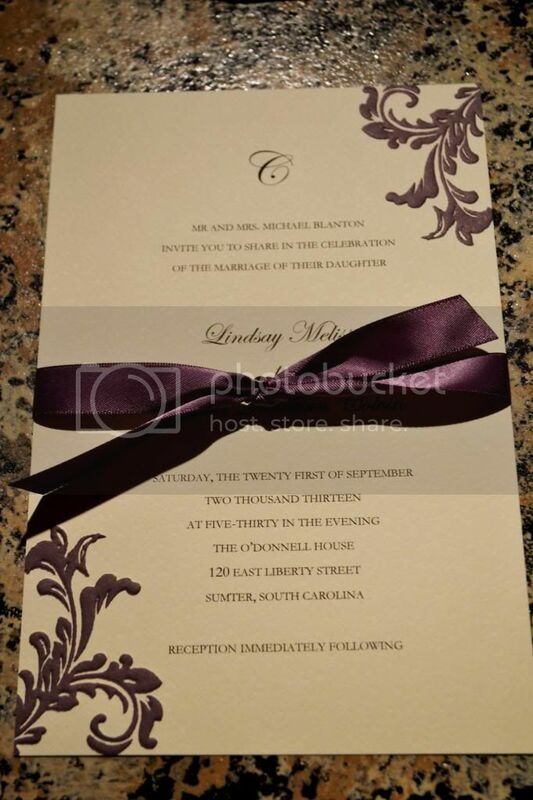 When I got them in the mail I was very happy with how they turned out and they looked awesome on the invitations. 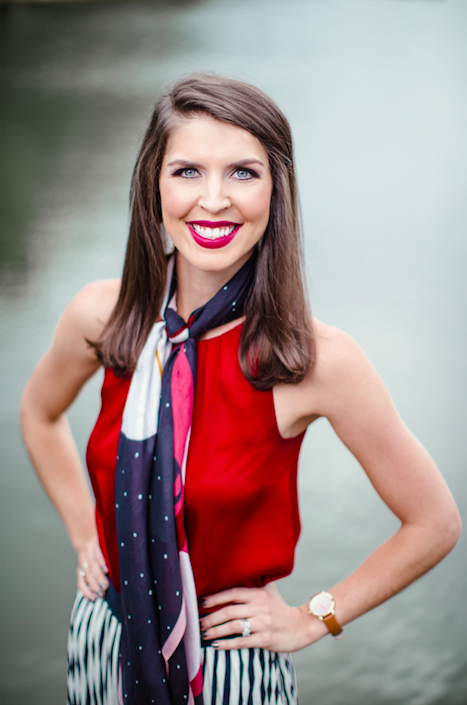 Just like our Save the Dates, Josh addressed all of the invitations (kudos)! 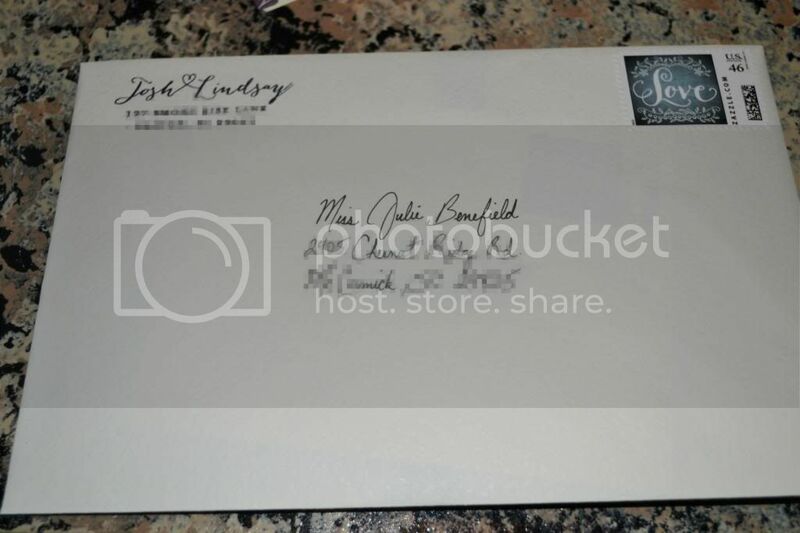 Josh loves the look of a sealed letter so we bought silver wax sticks from Michael's and a "C" stamp and wax sealed all of the invitations. What a tedious task, holy cow! 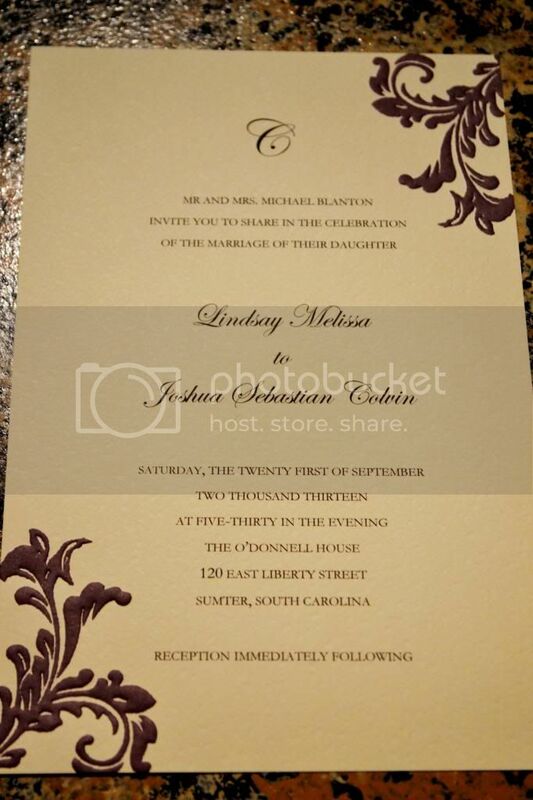 BUT I am glad that we did it because I really thought it tied the invitations all together. However, we did almost burn the house down a few times and maybe caught a few invites on fire...haha! But overall, not a terrible experience, ha! I was so proud of these invitations because we literally did all of it by ourselves and they turned out beautifully, I hope our guests like them as much as we do! I wish you could all see them in person, these pictures do them no justice! They are super cute! Love the stamp!